The amazing citizen science team that joined us on board for HWDT 4. Our new team of volunteer citizen scientists arrived in Kyle of Lochalsh on the 7th June in beautiful sunshine, very excited for the days ahead. After a quick meet and greet and a trip to the Co-op for some essential supplies (boxed wine! ), we decided to get underway, taking full advantage of the settled weather. That evening we arrived at our anchorage where we were surrounded by grey seals and were treated to an incredible sunset over calm seas. This, it turns out, was a sign of things to come! With the settled weather continuing for the majority of the survey we managed to cover an impressive 287 miles, spending over 37 hours on effort looking out for marine mammals, with a further 5:58 hours spent “with whales” (and dolphins)! Silurian's survey route for HWDT 4. The incredible conditions meant that we were able to survey the waters to the west of the Outer Hebrides, scanning waters that we were unable to survey last year. We were even able to reach the Flannan Isles, a cluster of islands that lie 20 miles of Gallan Head. 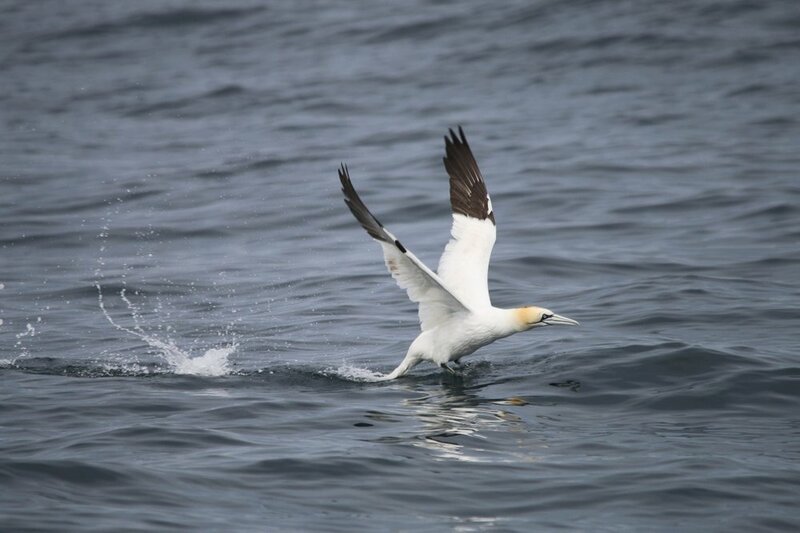 Here we saw a plethora of sea birds, with thousands of gannets nesting on the cliffs. In total, the team counted 3275 seabirds during the survey! Common guillemots were the most frequently sighted species (1176), followed by puffins (702) and gannets (470-excluding those we saw on land). 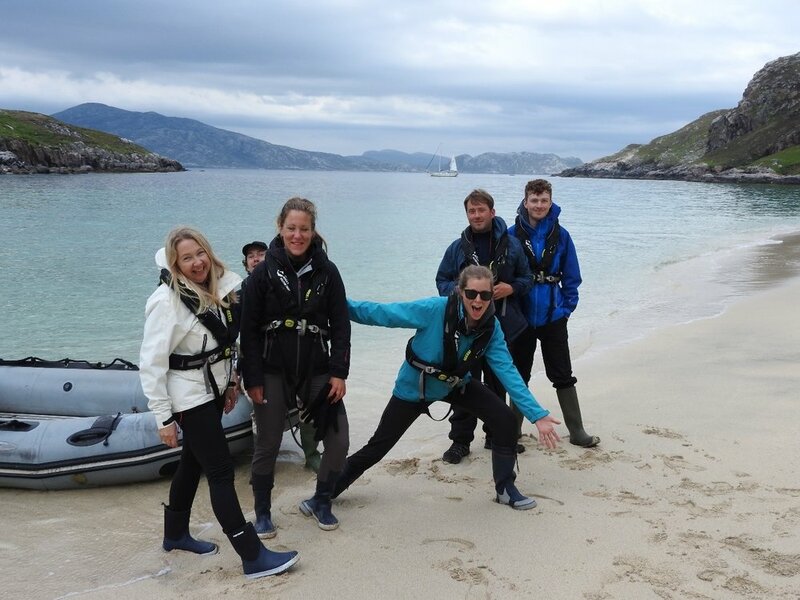 This also meant that we anchored in some spectacular spots, spending our evenings on remote sandy beaches and even coming ashore to see the Callanish stones, which are thought to have been erected over 5000 years ago! At the end of the survey, our luck with the weather ran out as Storm Hector blew through the west coast. We therefore spent the last day of the survey hunkered down in a secure bay playing games, baking crumbles and partaking in one of our infamous plankton parties. The gorgeous sandy beach at Scarp Island! We even visited the Callanish stones, which are thought to have been erected over 5000 years ago! We encountered an incredible variety and quantity of marine mammals, spotting 7 different species, during 127 sightings with over 338 individuals!! We saw common and grey seals, harbour porpoise, common dolphins, Risso’s dolphins, minke whales and some very friendly white-beaked dolphins, which we encountered on 10 different occasions. One of these encounters occurred on the morning of the fourth day of surveying. After leaving our beautiful anchorage at Scarp, we spotted a huge pod of white beaked dolphins with at least 80 individuals sighted, some of whom came to the boat to bow ride whilst other members of the pod breached repeatedly out of the water in the distance. An incredible experience for all of us on board! Massive thanks to the citizen scientist team who joined us on board: Archie, Nici, Peggy, Linnea and Susan- we couldn't collect the vital data without you. Thanks also to Scottish Natural Heritage who help fund the data collection programme aboard Silurian. Feeling inspired to get involved with our marine conservation efforts? It’s not too late to join us on board this season! We still have a few spaces on trips this season, including those departing from Ullapool, which gives us the opportunity to collect data from the northern reaches of our survey area, as well as a better chance of seeing another pod of white-beaked dolphins! !